The author’s Zebrasoma desjardinii appears to be telling the Pomacanthus navarchus to keep its distance by a show of size. 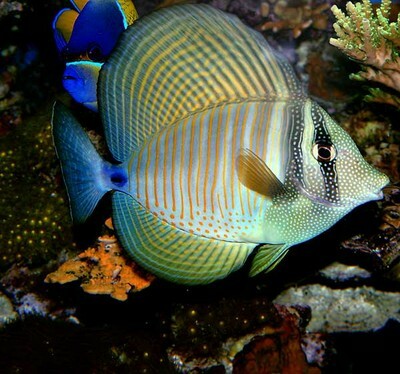 The surgeonfish has been with the author for more than 15 years and the angelfish has grown from a juvenile over the last 10 years in the author’s reef tanks. Interestingly, the P. navarchus has never damaged a coral or clam in the author’s reef tanks, but this is no guarantee that a different P. navarchus would be reef safe.